Is JVM for MIPS available? 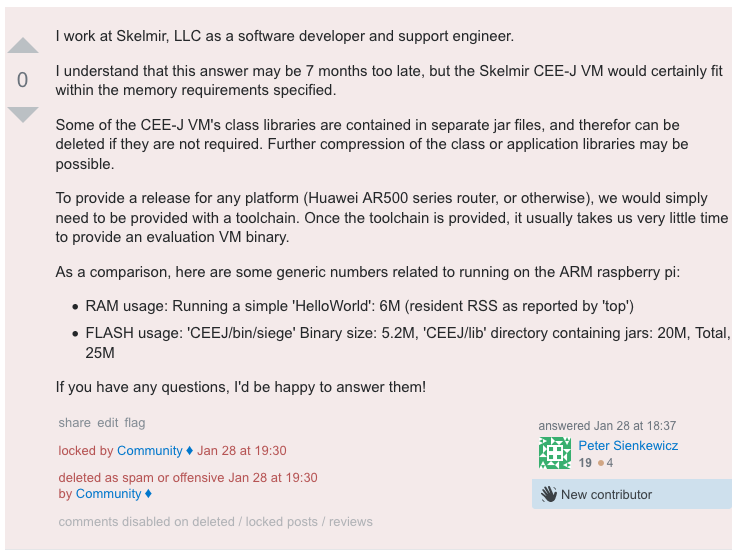 Which JRE or JDK can I manually install on a armv7l linux with less than 55Mb available? I believe that the above answers were both marked as spam because of their textual similarities and potentially also because of the self-promotion elements. My understanding based on these posts..
.. was that self-promotion is allowed, as long as its done sparingly, and it answers the question. In both cases, I picked posts to answer that either were asked recently or had recent activity. I not only tried to answer the question, but also to provide objective evidence that backs up the statement (comparable RAM/Heap usage). Finally, I also fully disclosed the fact that I worked for the company. As a new user, I wasn't quite aware, but now fully understand that self-promotion is frowned upon. Moving forward, I don't intend to just plug the company for which I work. I promise to do this sparingly. Rather, my intent is to transfer the knowledge I've acquired over the years of working with the Java programming language and with different JVM's. All that being said, are there any steps that I can/should take to unlock the above posts so that they could be edited/improved? If so, how can they be improved? Or are they permanently locked/marked as spam and I should just move on and work on generating other good answers/content? I'm quite happy you elected to step forward and discuss this, so let's have a constructive discussion about it. My understanding based on these posts ... was that self-promotion is allowed, as long as its done sparingly, and it answers the question. ...but did you answer the questions, though? I am looking for java support on mips. Is the JVM for Mips available? I tried downloading the jdk for java support but it is not available for mips. How can I port java on mips? "Java support" has been a buzz word with Oracle's recent change to their license and release models, since "support" now only happens with long-term releases, which is a paid service. In 2015 this probably didn't matter that much since Oracle hadn't done anything this radical, but it's fairly clear from the tone of the OP that they are looking for an official port. In general, in order for us to provide a release for any platform (MIPS architecture, or otherwise), we would simply need to be provided with a toolchain. Once the toolchain is provided, it usually takes us very little time to provide an evaluation VM binary. If you have any questions, I'd be happy to answer them! We don't do discussions on Stack Overflow. We do questions and answers. Just in the future, be careful about the self-promotion you want to do. While your service may actually be valuable, if your service went dark and we had someone who needed this knowledge look at your answer, they'd be frustrated that they couldn't get a solution to a problem after searching high and low. I believe that the other answers deal with the basics of self-promotion and what kind of post is appropriate in the site, and how your posts were a (very) bad fit for Stack Overflow; but it seems that you may have learnt something from your previous mistakes and are now more aware about those rules, or so you claim. All that being said, are there any steps that I can/should take to unlock the above posts so that they could be edited/improved? Nothing. I do not think that those are salvageable. There is no way to make them good. And they are posted to off-topic questions anyway (something it appears you still have trouble identifying: answer good, on-topic questions; answering the other kind is not helpful for the site). So changing them completely so they are different but good answers is not something to be desired either. The difficulty of your situation is that answer-ban is something that I believe not even a moderator could lift, since it's wholy automatic. Once you are in that hole, the only way to dig yourself out is by following these steps. Asking a moderator to clear the spam flag from either of these posts to help you get unbanned seems unfair, and counterproductive. The posts were spammy. They were correctly flagged and deleted. Your only possible recourse regarding these answers, and the situation they put you in* would be to try to ask for a post dissasociation, explaining why you are asking for it. Maybe that could help you getting unbanned, although I'm not sure it woul work. Whoever responds to your message might tell you more, if you ask clearly and explain the situation. You answer your question in your question. This means that most of your answers must be about other things, and not include any promotion at all. You only have 1 answer like that out of 3. This is why they are marked as spam. When you posted them, your sole presence seemed to be for the purpose of posting spam. Currently your deleted answers would not be a fit for Stack Overflow even if they didn't promote anything as you don't really answer the question. You are too chatty, don't provide an answer, and solicit extra contact, which are all big no-nos and red flags. Stack Overflow looks for answers that are short, concise, which you can look at and get the answer without having to ask for any extra details or tools. My advice is to try and answer a few questions on a subject you are familiar with, where you don't promote your product. Build up some reputation, and get to know how Stack Overflow works, and what is looked for. The one non-promotion answer you currently have is good, keep it up. And welcome to Stack Overflow! First, I'm glad you're aware of our self-promotion policies and have gone through them, as well as general advices on self-promo. I'm not sure how to start this off, so let me present you with an example of a good self-promotion first. But what's the difference between the example and your promotion? 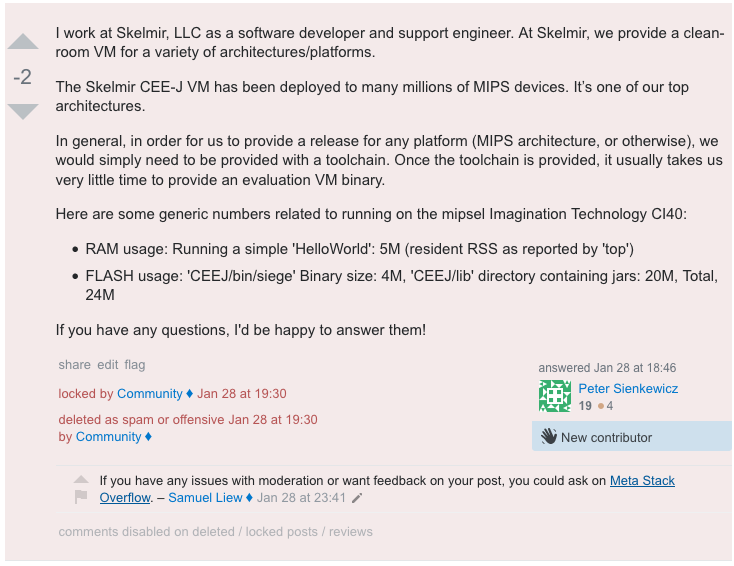 Just my humble opinion, it's that the other user has many other positive contributions to the site (Stack Overflow), and the promotional answer is also a valid answer to the question. Your answers follow the latter point since they're also valid answers to the questions. That's good, BUT. The questions, as noted by Martijn, are off-topic themselves, as they're asking people to find other resources. As said in the "close reason" text, "such questions tend to attract spam", and it's a reason why we take answers to such questions more seriously. I'd also like to point out that despite being valid, your answers doesn't add much value to the site and can IMO hardly be counted as "positive contribution". The other point, "other contributions", could also be a reason why your answers are considered spam. The author of the example answer presented above has many other decent answers, and we trust them more that they don't come for promotion. You have only 1 visible answer at the point, where two other of your answers are promotional. We allow some self-promotion if they come to answer, but we generally take it as spam when it comes with the intention to promote, which people may have thought so by looking at the way your answers are written. The latter one is what I want to emphasize: Come to answer, not come to promote. Bottom line: Thank you for your understanding of Stack Overflow and our policies. Keep the right thing in mind and you'll be another good contributor. Not the answer you're looking for? Browse other questions tagged support specific-answer self-promotion . Why was this post marked as Spam? Is promoting one's own product always spam? Is self promoting a product on Stack Overflow allowed? Is it ok to post a self-answered question about a product I own? What about highly upvoted VLQ answers? What is the policy regarding sparse self-promotion in answers?